If you've ever wished you could have a single folder in two different places at once, you should consider creating an alias, which is known as a shortcut on Windows-based operating systems. An alias looks like a folder, but when you double click it, you open the actual folder it points to. It's literally a shortcut to a different directory on your Mac. 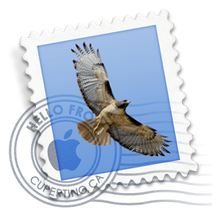 Apple's free Mail application is included with every Mac. Just add an account and you'll be sending and receiving email in no time. But how do you control when the Mail application receives new email messages? This tutorial discusses your options and suggests ways you can configure Mail on your Mac to fit into your lifestyle. Drowning in Email? Enough is Enough! If you listen to a lot of loud, trashy music with "explicit" lyrics (ha, ha), you may have noticed that iTunes displays a special label next to many of your song titles, as shown below. This is a parental control designed to help parents quickly identify and quarantine offensive music in iTunes. Unfortunately for those of you who don't have children, the explicit label is displayed by default, cluttering up your music library. Did you know that you can share the music, movies, books, and podcasts on your Mac with the other users connected to your network? You can. All you have to do is enable a couple of settings in iTunes. It's an ideal way to let others access your multimedia content, and it's a solution that works in homes, dormitories, workplaces, and even schools. From the iTunes menu, select Preferences. So you use Mail.app for email. And you've created rules in Mail.app to perform automatic and complex actions on incoming messages. If you're like most, you probably use rules to filer spam, move messages from certain senders to different folders, execute AppleScripts, and automatically respond to people when you're out of the office. Which is great! It seems ridiculous now, but in high school I purchased a Pioneer stereo system capable of pumping out over 1,000 watts of sound. The speakers and components were huge. It took three car trips just to get everything home from the store! The only thing I miss about that system is the equalizer on the amp, which allowed me to adjust the output of the sound levels. There's been a lot of talk recently about how the new MacBook Pros compare to existing Mac models. The new MacBooks are faster, of course. We know because the experts ran a series of tests to benchmark the computers and compare them to older models. But you don't have to let the experts have all of the fun. We've previously discussed how to change the DNS servers on your Mac, iPad, and AirPort Extreme. But how do you know which DNS servers to use? There are dozens of free DNS providers, and all of them claim to offer the best service. Don't worry. In this tutorial, we'll show you how to find the best DNS servers, no matter where you're located or which device you're using. Why Can't Anyone Tell Me Which DNS Servers to Use? Flying somewhere with your iPad this summer? You may need to learn about an important iOS feature called Airplane Mode. Turn this setting on, and your iPad will be compliant with federal regulations that prohibit the use of certain wireless technologies while the aircraft is flying. This tutorial provides a comprehensive look at Airplane Mode and how you can use an iPad on an aircraft.